1. First, proof your yeast. Add the 2 tbsp. water + 1 1/2 tsp. yeast + 1 1/2 tsp. sugar to a small bowl, and stir. Let sit until foamy, about 10 to 15 minutes. 2. Next, add the flour, salt, and garlic powder to a large bowl and sift. Pour in the yeast mixture, olive oil, and water. Mix the dough for a second. 3. Knead the dough very well for 10 minutes. It should be smooth and tacky after you're done kneading it. Form it into a ball, and coat it with olive oil. Place it back in the bowl and cover. Let the dough rise for about an hour. 4. Once the dough has risen, punch it down, and separate it into 16 sections. Roll each section into a ball, and place each ball onto a greased baking sheet. Let rise for another hour. 5. A few minutes before baking, preheat your oven to 350. 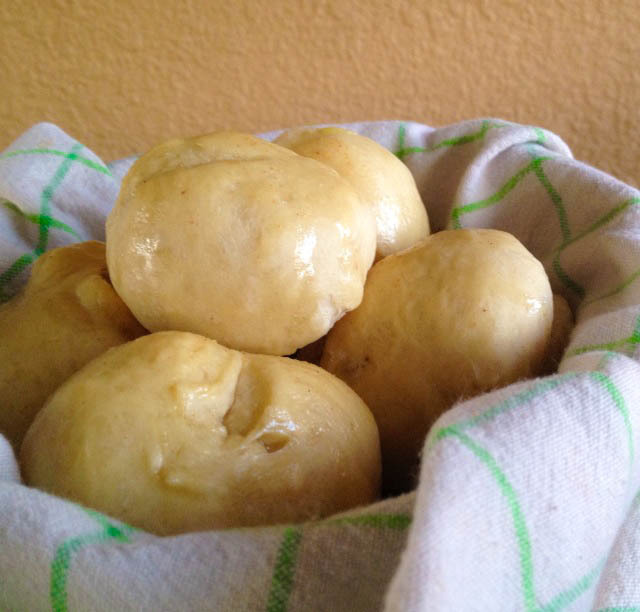 Bake the rolls for 15 to 18 minutes, or until golden-brown. Serve with vegan buttery spread. They were! I was surprised with how well they turned out. Those do look good - I hope there was a big hearty stew to go with it! There was...a nice and spicy Cajun stew. I've been loving the spicy stuff lately.